The time to study what’s happening in Bermuda in detail is the result of this correspondent’s photography accident (night sky shooting on a dark dock), which resulted in a shattered kneecap and a forced hiatus from summer cruising…When we started designing and building catamarans in the mid 1960s, the tools of choice were a slide rule, drafting vellum, wood splines, lead ducks, and plastic templates. The very earliest Velocity Predictions (VPPs) were run for us by Norm Riise, from punch cards on the mainframe computer at Jet Propulsion Laboratory at night when there was free time available. We had one of the very first CAD-VPP programs developed by George Hazen, and after a full night of crunching numbers would awake to a sailing monohull performance prediction that was pretty close. Now we have the ability to do highly complex VPPs in real time, use CFD to examine many aspects of design, FEI for engineering, and in the background be crunching photorealistic renderings. It’s been a breathtaking 50 years of progress. With all the technological changes we have adopted, one thing has remained constant in our own approach: a post-sea trial set of notes, recapping what worked as expected, and what we have found that surprised us. These notes end up in the form of Next Boat (“NB”) notebooks, there are stacks of them on a shelf in the storeroom, and in the case of our own yachts, are always completed before we start seriously cruising. The combination of an extensive powering database from our sailing designs, CFD and VPP analysis, coupled with tank testing, meant that there were no surprises performance-wise. What did catch us unawares was the huge increase in comfort. We were used to very fast passages under sail, with little of the motion that ocean crossing motor yachts tend to take for granted. So the increased comfort with Wind Horse was a very pleasant surprise. Except for one thing…We don’t like surprises. So we have spent most of our sea time with FPBs over the past 12 years–70,000+ nm now on our own bottoms–working out what it was that made the first FPBs such sweet passage-makers. It took a long time and a lot of miles before we were confident that we understood what was going on. At this point, having developed the FPB 64 and 97, we had no intention of going further. But then Wind Horse was unexpectedly sold, so we got to noodling. We looked at two potential replacement riffs: an updated version of Wind Horse with more interior volume in a slightly shorter hull, and a much higher volume design that would allow us to carry crew if desired, as well as better accommodations for, and separation from, guests. The hull shape, distribution of mass and the related polar moments, as well as the stability curve for these new designs, was significantly different from the first generation of FPBs. We felt reasonably certain that we could tease out a bit more comfort from the FPB concept. We chose the larger FPB 78 for our personal use because we felt it would allow us to continue cruising as maturity made taking crew prudent. But this was a close call, and if this decision had been made a few years earlier, we would have chosen the FPB 70. So here we are today, with 13,000 nm on FPB 78-1 Cochise, a sistership Grey Wolf II now cruising, a third 78 set to launch at year’s end, and two FPB 70s in build. As we are about to start cruising (now postponed for a bit) – those initial miles only count as shakedown – we have been working on our notes. What we will concentrate on in this post are several areas that have surprised us. The philosophy driving Wind Horse, the FPB 64s, and the FPB 97 was simple: maximize ocean crossing capability in a crew-friendly fashion, so that passage-making would be enjoyable rather than a chore. In terms of design parameters this boils down into a yacht that comfortably maintains high average speeds. A key driver in this is an interior arrangement that keeps the living areas close to the roll and pitch centers of the hull, which reduces the motion felt by the crew. This results in long, lean, easily driven hull shapes with minimum windage, and relatively low volume compared to the length of the hull. The efficacy of this approach is clearly seen in the number of miles already accumulated by the FPB 83, 64s, and 97. That these yachts are comfortable at sea goes without saying. By our sailing standards and compared to other designs, motion at sea is almost non-existent. But comfort is a relative term. If you are used to rolling +/- 25 degrees while running in trades, or pitching your way through waves while the off-watch tries to sleep on the cabin sole, the early FPBs were like mana from heaven. When Wind Horse was new we (and everybody else who came aboard) were entranced by the lack of motion; after a couple of years this became our new standard and we wanted more. First, when we started the FPB 78 design – 78 feet/23.95m is the official measured length, the actual LOA is 86’/26.3m – -we were chasing more interior space, something akin to that of the FPB 97, within a hull that was similar in length to the FPB 83 Wind Horse. We were also after a layout that allowed us to have crew and/or guests, with enough space for folks to have some privacy and separation. This meant we needed more height, depth, and beam. The tricky part here was that we would be living and working further from the motion centers of the vessel. If we were going to maintain the comfort level to which we and our clients had become accustomed, the motion in absolute terms had to be less. The next design goal had to do with systems. We have always pursued maximum systems efficiency and engineered an approach based on the assumption that the shore power cord was unplugged. These integrated systems combined a mix of batteries, charging capability, ventilation, and air conditioning that allowed the boats to sit for several days without running the genset. Solar power, while always part of the previous equation, was not a major driver in the design. But now with the data in hand from the FPB 97’s massive solar array, we saw that if we started from day one of the design cycle to organize our systems around a large solar array, a lot of good things would now be possible. Having put 13,000 nautical miles on FPB 78-1 Cochise in a very short period, we can tell you that the FPB 78 is extraordinarily comfortable uphill, much smoother and quieter than any of our previous yachts. When reaching and running, the motion is a little softer than the older designs, and still incredibly comfortable. But there is a definite conundrum. The hull shape required for upwind work is just the opposite of what you want when running with the waves. In this game of tradeoffs there is really no way, other than experience and gut feel, to know with precision the right balance between up and downwind design. For normal passaging, you want a bias toward upwind, because a yacht that can make long passages comfortably with waves on the nose has many more options as to where, when, and in what conditions it can go. The downwind steering capability is ultimately a safety issue. We are talking here about the ability to surf under control. The longer you can run at speed, the better chance you have at avoiding getting caught by truly dangerous weather. The minute you can no longer run, and have to turn around and jog slowly into the seas, you are now in the path of the oncoming adverse weather. During sea trials we were fortunate to experience a quickly building strong gale with very steep seas, and the surfing results were far better than we had dared to hope. Simply put, in steep, fast moving seas, FPB 78-1 Cochise tracks beautifully, surfs for long periods at 15 to 20 knots (or more), and the Simrad autopilot had no trouble steering out of incipient broaches when the occasional wave slap back aft threatened to turn us broadside to the waves. You can see video on this blow here. This is a large yacht, with more space in some interior areas than is safe at sea. The headroom is too high for handrails to be useful to shorter folks. The absolute requirement for security when moving about drove us to develop a system of Spectra rope “man lines” throughout the boat. These are tight, at a height where they are useful for Linda, and far more secure than handrails we have used in the past. Without exception the folks who have been to sea with us love them. We also have a pair of removable staple rails in the great room to break up the forward cabin sole. A quiet boat is a comfortable boat (and vice versa), and as a part of the initial design parameters we set aside a significant budget for noise control in terms of weight, cost, man hours, and materials with the goal of substantially reducing sound and vibration levels. This involved changing structure, increasing mass and stiffness, tripling the insulation in hull and deck, and installing sophisticated multi-layer sound dampening bulkheads. The result is the quietest boat we have ever been aboard at sea. At the other end of the comfort spectrum, we have experienced a pleasant surprise at anchor. Although the FPB 78 does roll a bit in some anchorages, the motion is so soft that we have rarely seen the need to deploy our big booms and their attendant flopper stoppers. In fact, we have recently shortened the booms by 10 ft/3m. The FPB 78 is a large yacht, with a fair amount of windage and drift. The norm with yachts like this is to have lots of fenders, the crew to handle them, make liberal use of bow and stern thrusters, and avoid tight places. This does not sound like a prescription for fun. Starting out with what we knew from the previous generation of FPBs, and taking advantage of a series of refinements in design and control, the FPB 78 is the most maneuverable, easy to handle of any FPB to date. Docking in the tightest situations has been a relative breeze. The bow thruster has proven to be unnecessary and the tunnel openings for it have been sealed to reduce maintenance and drag on FPB 78-1. In “docking mode” a second autopilot pump in parallel delivers a 90-degree hard over to hard over time of seven seconds. This extremely quick rudder travel opens up a new world of maneuvering capabilities in crosswinds. From dead in the water, you can rotate in 1.5 boat lengths without using the inboard engine. With the outboard engine forward and the inboard reversed, rotating in a single boat length is easily accomplished. Another major advance comes from the wide anchor platform which provides an easy way to pass lines ashore with the bow pointed into the dock in strong breeze, after which the line ashore becomes a rotation pivot point. We have used this bow-at-right-angles technique several times when faced with strong winds blowing us off the dock, or in areas with strong currents. As expected, the FPB 78 responds well to stern spring lines, and we are pleased to find that bow springs also work well in bringing the boat onto dock. The remote controls, one on the Matrix deck and the other on the main deck, have turned out to be very handy. When there are just two of us aboard we pre-position the main deck unit, and then after the initial line is ashore the helmsperson can come down from the Matrix deck, help with the lines, and still quickly make adjustments to engines and helm. The aft deck, and dinghy handling approach, has been evolving since before we began cutting metal four years ago. The design today, after many iterations, is quite different from the original. For example, the area above the engine room air vent has gone from a simple seat and barbecue station to an outdoor galley and food prep area. A significant portion of this refining came after the same area had been developed for the FPB 70, which looked so good that we adopted the FPB 70 approach to the 78s. Having spent a lifetime in sail handling, the big booms and winches we use for launching and retrieving dinghies is second nature. It is also the most dangerous exercise there is aboard. So with these new FPBs we set out to simplify the rigging and make it easier to handle the dinghies, particularly in rolling anchorages. We spent hundreds of hours doing 3D simulations, more time during build with experiments and changes, and 17+ variations with FPB 78-1 in the water. The final mods took place just recently, and we are ever so pleased to tell you that once through the learning curve the dinghy can be handled by one person if need be (although we recommend two for safety reasons). At anchor both dinghies are stored outboard with davits. The large RIB sits on top of the davits. The rowing dinghy is hung under the port side davits. This frees up the aft deck for lounging and entertaining. The FPB Matrix deck has been in constant flux since we began designing the new FPBs, and this has not yet stopped, although we are close (maybe). The space is so much more useful than we originally imagined, we have been loathe to commit to a final layout. So far, we have kept FPB 78-1 in a flex mode. This keeps us able to move around furniture, add a second couch, and generally play with the optimal layout as our definition of optimal changes. In a conventional sense, the Matrix deck works well as a piloting station: great sight lines, lots of space for nav gear, charts, and reference manuals, and it’s everyone’s favorite lounging spot. The ventilation is excellent and we have not yet used the air conditioning up there. The roll-up back window is easy to use, and most of the time just one or maybe two of the opening doors or windows gives us plenty of air flow. The major change that has taken place so far is to reorganize things a bit to make the space more efficient for keeping watch on passage, and to improve the ambiance when it is used as a living area. A few small modifications have made a big difference. We have lowered the navigation desk four inches/100mm. This has an enormous impact on the visibility from all positions, and makes it possible to maintain watch while seated all the way aft, which is the most comfortable place to be on the Matrix deck when headed upwind. Sightlines forward over the lowered nav desk are now excellent. Another benefit of the lower desk is that we have been able to use lower helm chairs, eliminating the foot rest bars and making them more comfortable. We have copied the navigation monitor approach used in the great room, and installed a 55” television on an articulated wall mount in the middle of the starboard coaming (FPB 78-3 has two of these 55″ tvs). The vertical orientation of this installation reduces glare on the surrounding area at night. The monitor can be viewed from one of the helm chairs or from any other seated position. The overall impact of this is to make the Matrix deck more efficient when conning the boat, as well as much more user-friendly at sea for watchstanding. The ambiance for general chilling is greatly enhanced. A part of the design evolution for these new Matrix decks includes the incorporation of light but strong laminated glass windows. This has proved so successful on the FPB 78 that the FPB 70s are being done in similar fashion. 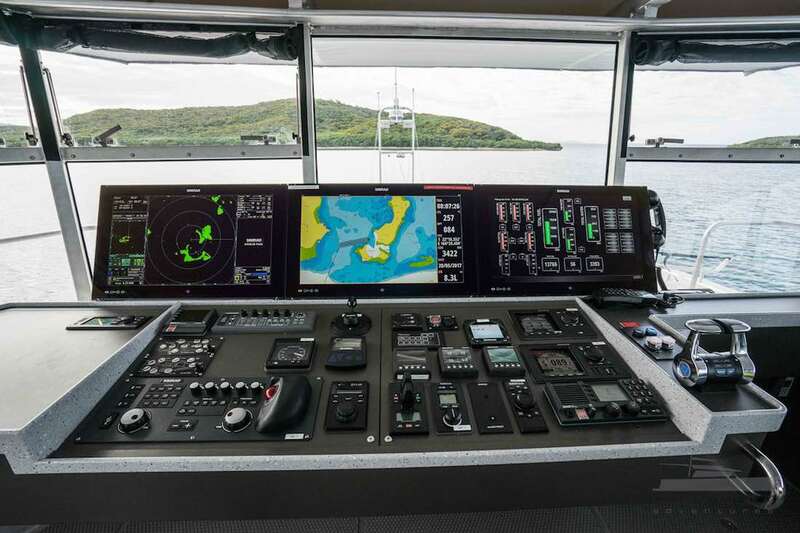 The remote control used for docking now includes a Simrad OP 50, that allows for control of radar and other functions. Having this remote by our side gives us the ability to sit aft with our feet up when on watch during passage. The main driver in yacht systems design is how you approach HVAC. In the tropics, most yachts require a generator 24/7 to provide power for the air conditioning. In the past, we used a combination of natural ventilation, awnings and insulation, to reduce heat loads to where we could get away with running the generator just a few hours a day. The large, highly efficient solar arrays with which these new FPBs are fitted have gotten us to a place where fine-tuning other parts of the equation can significantly reduce and/or eliminate generator time entirely. Along with our usual approach to shading and awnings, we have enhanced the natural ventilation on board with the addition of passive and powered fan inlets and outlets. Additionally, our normal heavy hull and deck insulation has been tripled. Coupled with battery banks even larger than our robust standard, it is now possible to spend long periods of time with zero carbon footprint. 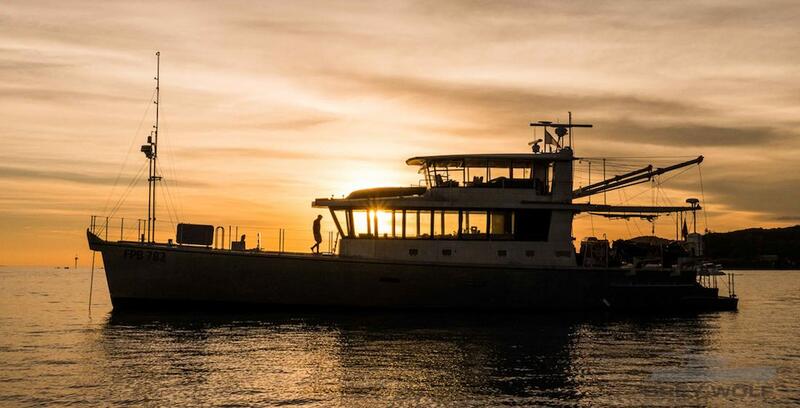 Aside from helping the environment and having a quieter home, the elimination of the daily fuel burn from the genset significantly enhances the yacht’s endurance. Where most yachts Cochise’s size would require 20-30 gallons of diesel per day just for electricity needs at anchor, the FPB 78 uses little or none. This daily savings really adds up over a period of months, to the point where it can significantly impact how much fuel is left for passaging and/or how often you have to arrange to purchase fuel. Comfort, interior temperature, humidity, noise, and the ability to enjoy yourself off the grid for long periods of time are all intertwined. Cruising in tropical Fiji with Cochise, we averaged one hour of generator time every third day. When FPB 78-1 was docked in Fort Lauderdale, we didn’t even bother to connect the shore power cord. One of the design advances that gives us the most pleasure is the change in the aft area of these new yachts, one that allows for both a spacious engine room and a separate, isolated area. On FPB 78-1 we are using the space as a combination workshop/crew accommodation. On Cochise this area is referred to as the “Executive Lounge”, and we now have the room to lay out both the power and hand tools in a very efficient, easy to use manner…We think it is radically cool! We have already discussed how much more comfortable the new FPBs are at sea than even their predecessors, as well as their increased maneuverability. The question now before us is: what about fuel burn, speed and range? The real world data on the FPB 70 is still a ways off, but we now have lots of good data on the FPB 78. The FPB 78 has 60% more displacement than the FPB 83, and probably double the volume (counting the Matrix deck) of the FPB 83. Even so, at ten knots cruising speed, in calm conditions, the fuel burn is similar to the FPB 83. At higher speed length ratios, starting around 10.25 knots of boat speed, the fuel burn rate begins to increase compared with the much smaller FPB 83. Likewise, the additional windage costs us fuel burn upwind, but then pays a dividend by acting as sail area off the wind. In terms of speed and range, the FPB 78 has a demonstrated capability to go 4,700 nm upwind in the trades against the prevailing waves and current, averaging ten knots speed over ground, with 500 gallons of fuel to spare. If you were going in the opposite direction, downwind with the current and waves, you could increase speed by over a knot, while reducing fuel burn by 10%, extending range to over 6,000 nm with the same surplus left over. We expect that the FPB 70 will be comparably efficient at low speeds, and slightly more efficient than the 78 at higher speed length ratios. Cochise just spent the last four weeks in Cory and Angela McMahon’s Triton Marine boatyard in Beaufort, North Carolina. We completed a couple of the items discussed above, made a few additional refinements here and there, and dealt with our punch list. The “NB” notebook is done and and we were ready to go cruising. Cochise is now back in storage, while the knee heals. This entry was posted on Friday, June 16th, 2017 at 1:39 pm and is filed under Dashew Logs, FPB 70, FPB 78, FPB Series Notes, The Logs, Yacht Design. Both comments and pings are currently closed. Sorry to hear about your injury and glad to hear that it has not diminished your spirits and that you are making a speedy recovery. Hi Steve: Thank you for the update and sorry to hear about your mishap. I’m curious about the Halo radar: are you happy now with its performance or did you replace it? Simrad replaced the antennaes to long range, and in smooth water it works fine. But it is still not usable in sea clutter. However, this is probably a software issue and we are hopeful it will be fixed in an upgrade. But at present it is not usable for small target in sea clutter. Fantastic post, can’t thank you enough……I like it when you have more time to write. Perhaps think of it this way, more time for writing makes your knee a better sailor……very best of luck on that subject. As FPB ‘diesel’ nears an obvious plateau of perfection I do so hope you find the interest/motivation to delve into the possibility of a prototype electric powered FPB. From what I have observed it takes a Dashew to redefine what’s possible. Am so very sorry to read about your mishap — i’d had an intuition that “something” had happened. Seeing the AIS-report still fixed on the 7jun-arrival at JBB, and noticing thusly that the Berthon-usa “fpb open-house” scheduled for this weekend (17-18) in Newport had “disappeared” — my first notion was that an unexpected complication with the work being done on Cochise had occurred. Our prayers are for your swift and complete healing — and for everyone-else’s peace while that’s unfolding; especially, Linda’s and Sarah’s. do you think the owners of Grey wolf. [FPB 782] will write up a bit on the electronics they have incorporated.. I noticed in the Pick posted the forward Mast is WAY taller than any previous system.. and I’m sort of wondering on what extra they felt they need up front..
any reports on how the New LED lights on the front mast are working..? Steve thanks for the update.. always fun to read what is happening.. Thanks Juergen – The taller mast forward is required for the correct steaming light height. New LEDs are very, very bright, with tight edges. Looking forward to putting them to work for real. The higher Steaming Lights, is that a requirement of the country of register, or is that a change in all vessel of the 78’s size..? It’s just looking at it from the side.. the Tallest position is way higher than the top of the Matrix bridge cross beam, where the radars and such are mounted..
On thing with the 782 I do like it matrix bridge layout and design..
and Yes A 78 is still on my Wish list of Wanted boats.. I don’t have the exact data handy but COLREGS require a certain height for the steaming light above the deck. The language is such that there are aspects subject to interpretation. Hence the forward extension mast. That’s a paraphrase of a statement made by Nainoa Thompson currently president of the Polynesian Voyaging Society and the first Hawaiian to practice the ancient Polynesian art of navigation since the 14th century when describing Wayfinding. IMO, it applies to the FPB series. The voyage is never over. Sorry to hear about the injury. Look forward to seeing the 70 when she is out and about. I love the look of the series, but wondered what they would look like painted, is this an option? Have you ever made any sketches with it painted? Keep up th posts really enjoy your wblog. Our suggestion has always been to try the boat unpainted for a season, and then if you feel the need, have the work done. Since 1988 nobody has painted one of our sail or FPB yachts. I can believe this as initially I really disliked the “blotchy” aluminum look–I have even commented about it here several times–but as time has passed it gets harder and harder to ignore the virtues of an unpainted aluminum boat. I think the only thing I might do differently is sand blast or polish the entire boat when construction was completed. That way all of the aluminum would be more even in tone as it “aged”. We originally had a medium grit sand blast texture on the topsides of Sundeer. It was very smooth and even when new. The problem came when trying to touch up a fender burn mark or scratch. Sandblasting per se is a hassle and we found it difficult to match small sections. Sundeer was quickly converted to a grinder pattern. Steve, just a thought, but have you considered adding more solar panels to the Aft deck in the form of a pull out “drawer” under the existing panels? These additional panels would be stored during passages or when the dinghies were up, and pulled out at anchor for both aft deck shade and more power to eliminate the every 3rd day generator running. Best wishes for a speedy recovery! We have thought of many options for adding solar panels, but not a slide out system. Will keep it in mind. However, we first want to gather a bit more experience with the boat to get a better handle on power consumption while at anchor, as well as power generated in locations like Maine and Newfoundland. I have often thought that back cover would also be excellent for rails used for a really simple boat recovery system. It is the perfect structure and location for rails. We met in Panama where you were in the marina on the Pacific side and you kindly gave me a tour of Cochise. Hope your knee heals ok. The photo of your console made me think of this: we recently designed a tugboat bridge using Alphatron (mostly big ship bridge console designers; now owned by JRC). They did a very slick radar/chart plotter display. When the tug is working up close and you don’t need to see these – they slide down out of the way behind the console. You might consider it for your boats when at anchor – make the view out the front windows much nicer, but slide back up when at sea. Could tilt the displays flat as well. So it has to be at least the height of the beam of the boat, given that the 78 is probably just over 6m, and has to be forward of amidships. You could get an exemption from your flag state to carry just aft of amidships on the aft mast if you really tried a bit. Don’t know why you’re carrying it so high – unless you have NUC lights on same mast? Which would be very odd for a pleasure boat.